This event is offering Modern Jive dancers the chance to immerse themselves in a weekend of top quality workshops and freestyles. In addition to Modern Jive, you will also get workshops in Blues, Ballroom, Double Trouble and Airsteps. Check out The Teachers page for more about what's on offer. In the evenings we have Modern Jive in the main hall and a separate Blues Room running late into the night. In the main ballroom this weekend we have an impressive lineup of experienced DJs. We will have some fabulous music catering for all tastes including blues well into the early hours. You may check into the hotel any time after 3pm on Fri. You must check out of your room by 10:30am Monday. Workshops run continuously between 10am and 6pm on both Saturday and Sunday. 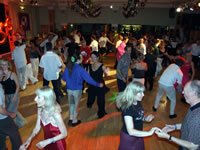 Evening dances run Friday, Saturday and Sunday from 9pm. The Theme for the Saturday Night is "The Greatest Showman". A £20 deposit holds each place until 5 weeks before the event. You may check availability over the phone but please complete our form to make your booking. Currently we accept payment by cheque only.